I typically don’t go around trumpeting the arrival my latest pod episode to friends and family. Everyone is busy with their own thing, and I figure that if they’re going to listen to it, they’re going to find their own way to it. Human nature being what it is, they’re not likely to establish a listening habit just because I’m reminding them that HEY, I JUST POURED MY SOUL INTO MAKING THIS LATEST RECORDING. 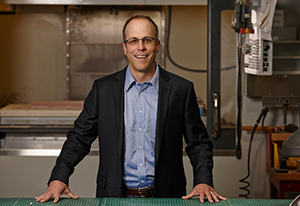 Michael is the founder of Harrison Metal. As you’ll hear in the podcast, he did a ton of remarkable things before launching Harrison Metal, too. Michael and I met over ten years ago when he helped out as an “Industry Coach” for the Creating Infectious Action class which Bob Sutton and I used to teach at the Stanford d.school. He subsequently became a Consulting Associate Professor at the d.school, and it was fun to be on the faculty there together. I am a big fan of Michael’s character and intellect, from which it follows that I am also a big fan of his feed on the Twitter. For this pod, we use that as a launchpad to talk about venture mechanics, gross margin, the clocks in Greenwich, modern capitalism, organizational life, why Harrison Metal is called Harrison Metal, and how a certain type of aquatic mammal will inherit the earth. With the release of each new pod over the past year (save for one), I’ve consistently felt like the latest one is my favorite one ever. Ferry Porsche once said something similar, that his favorite Porsche was the one yet to be designed. My favorite pod is actually the next one to be recorded: I learn so much making these, I listen to other people’s work and learn from it, and I try to roll whatever insights I’ve had into our next recording. So it’s safe to say that this episode is by far my favorite one until we record another one. But who knows? — perhaps this is the high water mark. Let’s ask the dolphins. For as long as I can recall, every Memorial Day weekend I’ve watched the Indy 500. At its best, the race is where ingenious innovation meets courageous competition. For me, Indy’s race teams and drivers embody an entrepreneurial, just-do-it spirit which is just plain inspiring. 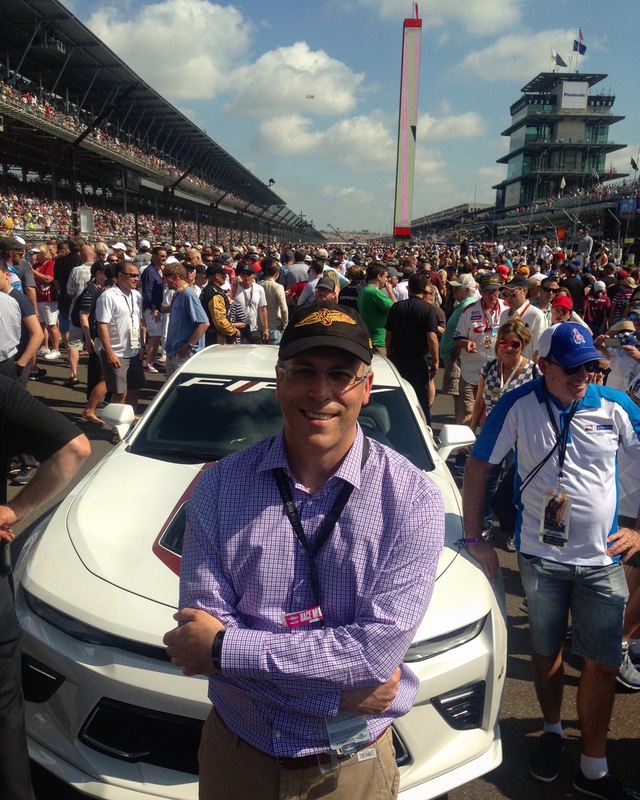 Sports can bring out the best in humanity; the alliance of people and technology competing at the Indy 500 makes it a living, breathing exemplar of my favorite maxim: don’t get ready, get started. So how did it feel to speed across the same tarmac graced by legends like Hanks, Mears, Clark, Sullivan, Franchitti, Foyt, de Ferran, Andretti, and Gurney? LOUD! : as you can hear, I had a big Honda V-6 whirring away a few inches behind my spine. It’s a scintillating noise, but it certainly gets inside of your skull! And at higher track speeds so much air is rushing by your helmet (and trying to lift it off your head) that the wind almost downs out the sound of the motor. Warp-speedy: Tristan really put his foot in it leaving the pits, so the acceleration we felt was, ahem, slightly more robust than what I encounter in my daily driver Honda Accord. I was pinned backward, doing my best to keep my helmet from bobble-heading to the right as we navigated the long left arc of the lane that popped us out at the exit of Turn 1. As it turns out, my neck muscles aren’t quite up to the standard of the tree trunk that props up Fernando Alonso’s noggin… I definitely felt those g-forces! Two other big impressions of speed: First, at only 46 feet wide, the track seems much tighter in person than it does on TV. And from the cockpit of a car at speed, it feels even narrower… as we were circling I kept thinking “How on earth do these drivers go three-wide into Turn 1 at over 220 mph?”. I still don’t know. My second vivid memory of Indy speed: entering Turns 1 and 3 there are “3… 2… 1…” sign markers along the fence, counting down in hundred-foot increments to the beginning of the corner. These sped by so quickly that I couldn’t quite process their blur! Serene: between Tristan’s gentle control inputs and the seamless —even glassy — quality of the track surface, the rest of my ride can best be described as smooth and… relaxing. Really. It felt as if we were wafting along on a magic carpet. It was beautiful. I spent my time enjoying my unique view of the Pagoda and the grandstands. I could have stayed in the car for a whole hour. So, did we go fast? Yes, it was fast. At least by everyday standards. Those of you with a stopwatch will note that we lapped the track at a tick under 60 seconds. Indianapolis Motor Speedway measures 2.50 miles in length, so our average speed was a bit more than 150 mph (240 km/h). That’s not slow at all: it’s the takeoff speed of a Boeing 737, and it’s more than double the speed limit of a California highway. It’s even fast in the context of the 101-year history of the Indy 500: if Tristan and I had run our lap in 1962, we could have qualified on pole ahead of the legendary Parnelli Jones, the first driver to ever break the 150 mph barrier at Indy. But on the other hand, it wasn’t that fast. IndyCar driver JR Hildebrand qualified for this weekend’s Indy 500 with a 230.889 mph run, just under a 40 second lap. Put another way, when Tristan and I are exiting Turn 3 in the video above, JR is so far ahead of us on track that he’s already flashing across the start/finish line. And when he arrives at Turn 1, he’s hurtling forward at an astounding 238 mph (383 km/h), almost 90 mph more than us. Visualize the fury of a train passing you at 90 mph — that’s one mighty speed differential. For the gearheads among us, at top speed JR’s car packs 250% more kinetic energy than does my car. And upon entering Turn 1, he experiences exactly 745% of my baseline pucker factor. My biggest takeaway from lapping the Speedway? That the athleticism, courage, and skill required to race an IndyCar at speed is almost beyond comprehension. What these men and women do is truly remarkable. A week or so ago Om Malik asked me for my thoughts on the design history of Porsche and how it might relate to that of Apple. I sent him some links to some good articles about Porsche design (including this interview I did with Porsche’s Michael Mauer), as well as to some of Karl Ludvigsen’s remarkable books on Porsche. 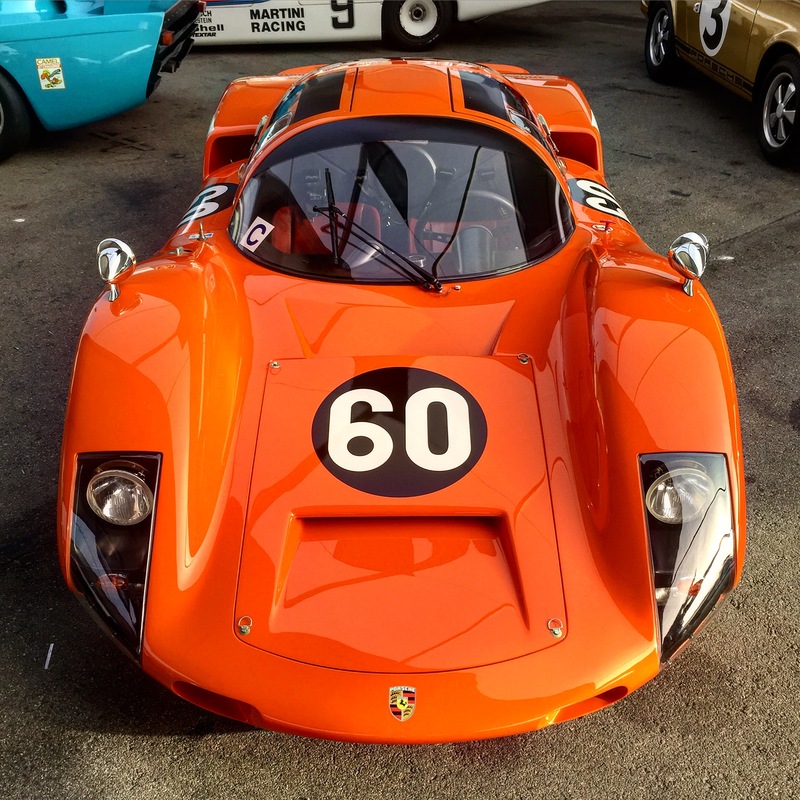 A few days later Om contacted me for a quote about Apple and Porsche, which I duly supplied. In 1947, Porsche began work on its 356. In many ways it was like the original iPhone. It wasn’t perfect. It was underpowered. But it was streamlined and aerodynamic. From the 356 to the 911, a distinctive marriage of form, function, design, and brand ruled every design. It became the core around which Porsche was built. Porsche’s and Apple’s design philosophies are similar. Much like the 356, the original iPhone was about defining a foundation for the future. It was different from other phones on the market—it made a rectangular touchscreen the main way to interact, displacing buttons and keypads. Now the iPhone is the essence of a phone. The MacBook, the iPad, and the iPhone are all a study in constant refinement. Sure, there are product designs that leave us scratching our heads—having a USB-C charging port on one laptop and something else on another, for example—but place the first iPhone next to the latest one and you can see their common language. The same goes for the iPad and the MacBook. These are obviously topics which I loved thinking about, and it was a pleasure to appear in Om’s piece. I had a wonderful time in conversation with Kevin Kelly in this podcast. Not only did we speak about his new book The Inevitable, but we also explored Kevin’s creative process, which he defined as “write to think”. We share that creative approach in common, for sure — I have to be able to see my thinking in a sketch or prose in order to understand what I’m thinking. Ergo this blog, my love of sketching on my iPad pro, my abiding belief that no working room is complete without whiteboards stretching from floor to ceiling, and a preference for big pieces of paper over tiny Post-it notes. How can you flow an idea across a few square inches of paper, anyhow? In my humble opinion, for anyone engaged in the art and science of bringing cool stuff to life, The Inevitable is one of the most important books of 2016. Or perhaps of the past few years. I highly recommend finding the time to read it and digest it and act upon it. Spending time learning from the guests on our podcast is always a highlight for me, but having Kevin join us was an extra special thrill and honor for me. The first issue of Wired Magazine came out just as I was graduating from college (I still remember reading it! ), and in many ways it has been the chronicle of so many of the digital technologies I’ve been able to shape over the course of my career. And a good part of the point of view I bring to that work is shaped by Kevin’s teachings and worldview, so it’s just plain neato to be sharing the same audio bits and bytes with him. The more that I do what I do — which is to bring new things to life by helping others do the same — the more I believe that there are some aspects of business behave in a way that’s similar to the laws that underpin physics. In essence, they are something akin to laws of nature, inviolable and highly predictable. 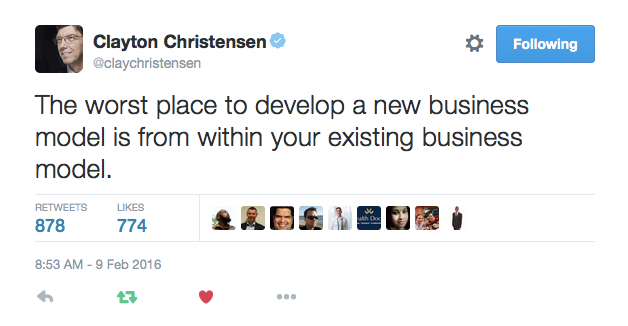 This statement by Clay Christensen feels like it’s one of them. Trying to grow a new business model inside of an existing business is like trying to raise a baby whale on dry land; in principle it should work (it breathes air, it’s a mammal, we’re mammals, we breath air), but in practice it’s going to kill the whale. Or at best limit what it could have been by forcing it to become an animal different from what it wanted to be. This past fall, I became a volunteer American Youth Soccer Organization (AYSO) referee. My experience as a neophyte referee was one of the most meaningful things I did last year. I didn’t expect AYSO soccer to help me grow in my professional life, but with an open heart and mind, insights can come from anywhere. Founded in 1964, AYSO’s mission is to provide world-class youth soccer programs that enrich children’s lives. 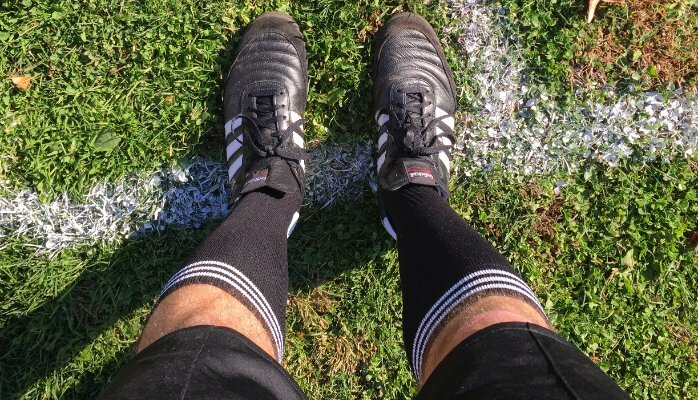 On any given Saturday in the U.S., you’ll see teams of boys and girls chasing the ball in AYSO soccer games, with refs like me there to ensure that everyone has an experience that’s safe, fair, and most of all, fun. After several evenings of training, I qualified to referee matches for kids under age 8. Run without goalies, their games feature stunning breakaways and enough breathtaking shots on goal to make Arsène Wenger green with envy. This is real soccer. I’m fairly fit, but in our matches I had to run hard to keep up with these future Carli Lloyds. Seriously though: 7-year-olds can sprint really fast! My professional life revolves around bringing new stuff into the world, and helping others do the same. As such, I’m always on the lookout for better models for leadership in the pursuit of creative outcomes. I used to think of the role of orchestra conductor as great metaphor for creative leadership, but in my experience it’s too hierarchical an approach to work in most contexts. Recently I’ve written that leaders should think of themselves as gardeners. But who in the workplace wants to think of themselves as an innocent head of broccoli on the receiving end of fertilizer — or even a spade? In a world where the dominant mindset of referees (and bosses, and sometimes even coaches) is to be an enforcer rather than a teacher, this is easier said than done. Here’s an experience I had trying to live the PIE philosophy on the field one bright Saturday morning in California. I had a talented player who was full of energy and having a good game, pouring huge amounts of energy into her play. However, as the match flowed on, I noticed that when in close quarters with other players (from both teams), she was consistently a little over-enthusiastic with the sharp parts of her elbows. How to enforce the rules while being as positive, instructional, and encouraging as possible? I gave my whistle a pip, gathered both squads around, and calmly asked them to all position their arms like chicken wings. And then I asked everyone to give them a few good flaps. We then observed as a group that when our arms were out like this, touching other soccer players with our elbows could hurt someone, and that didn’t seem like a fun way to play. With nodding of heads, some giggles and some smiles, we recommenced our soccer frenzy with an exciting drop-ball. I guarantee you that this intervention was more effective, more memorable, and positive for everyone — players, parents, coaches, me — than the standard approach we see in sports or at work: a penalty whistle meant to shame a specific individual, reprimanding them in the present to limit their behavior in the future. Now, would a chicken-wing circle be appropriate when Martin Skrtel stomps an opponent like a flamenco dancer who has slurped one too many espressos? No, but I believe that individuals raise or lower their behaviors and beliefs to the expectations of the environment they work or play in. A consistently positive, optimistic, and encouraging culture can teach people that there’s a better way to be in the world. Built into the core of a culture, a guiding philosophy like PIE creates the ideal circumstances for an up and coming leader to practice a form of leadership that helps other people grow to become the person they want to be. When it comes to leading people in creative endeavors, you could do a lot worse than to think and act like a PIE-centered referee. Keeping players engaged in a flowing game, stopping play only when absolutely essential, and using those moments as a teachable moment where the group almost leads itself — it’s a wonderful metaphor for creative leadership. As Stanford d.school founder David Kelley once said, “I can give you the confidence that you are a leader by giving some experiences where it comes out better than you thought and you were the leader.” A PIE approach — positive, instructional, and encouraging — helps you lead in that way. All of this is why I’m proud to make being an AYSO referee part of my life outside of work, and it’s why I hope to keep on carrying a whistle (but not blowing it much) for years to come. – Clay Christensen, Michael Raynor, and Rory McDonald, What is Disruptive Innovation? Amen. This is a wonderful, very timely article. Mandatory reading for anyone engaged in the art and science of bringing cool stuff to life. As the duty for driving shifts from humans to computers, our shared definition of what a car is will undergo a radical transformation. When you think about it, the modern automobile still hews closely to a design template set by the Ford Model T: four wheels, a gasoline engine, some forward-facing seats, and a steering wheel for the driver. By 2025 that monolithic automotive design paradigm will fork to create multiple new branches on the family tree, each representing a new species of car. Some will be fully robotic, others will not. Some will be powered by batteries or fuel cells. Some will be for active driving, but most will be designed passive ridership. So self-driving cars present a fork in the road, and we need to take it. Here’s the design opportunity: if we proceed thoughtfully and with some deliberation, this branching of the automotive tree could increase our access to high-quality mobility while making it a better experience, too. What would this branching look like? Former BMW design chief Chris Bangle can help here. In a design conversation that he and I shared a few years ago, he articulated a nuanced distinction between “cars” and “auto-mobiles”. A “car” is an emotionally evocative machine such as the Jaguar E-Type. An “auto-mobile” serves up utilitarian transportation with a minimum of fuss, such as the anonymous (but competent) sedan I rented at the airport last week. Whether or not it’s a “car” or an “auto-mobile” that gets created depends on the point-of-view of its designers. post-fork opportunity: None. Auto-mobiles in this category will eventually cease to exist as human drivers become uneconomical for routine activities. post-fork opportunity: Big gains for the likes of UPS and Uber, as robotic delivery auto-mobiles carry goods with higher levels of efficiency and utilization. Also, a better commuter experience: individual passenger auto-mobile pods become akin to public transportation, with shared or societal ownership. post-fork opportunity: The $100,000,000,000 question: what exactly is a car that’s as fabulous as a Mandarin Oriental lobby but willing to drive us anywhere we want to go? Massive innovation opportunities to be had here—we can’t yet imagine the experiences created by these types of cars. examples: None extant today, though the remarkable Porsche Mission E concept provides a small glimpse of this future. 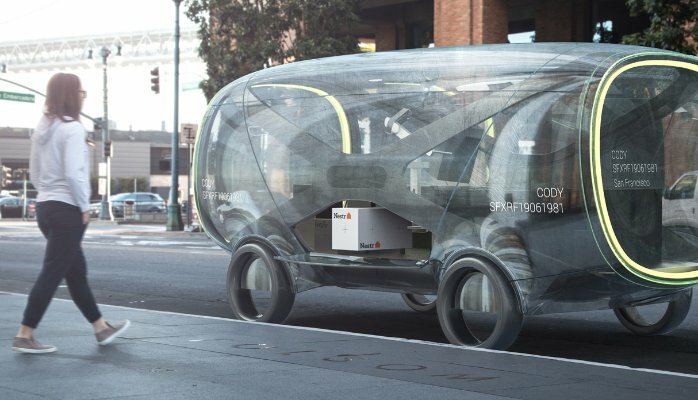 Given their highly emotive designs, I wouldn’t be surprised if people want to own (or lease) these living rooms on wheels. post-fork opportunity: Internal Combustion-powered cars as the new Patek Philippe watch—more complex and less capable than their solid-state cousins, but a visceral thrill as well as a status symbol for those who choose to display their money this way. The recent run-up in prices of vintage Porsches is evidence that non-autonomous cars with manual transmissions and gas motors are already being priced in anticipation of this scenario—the thrill of driving a complex machine fast will become a rarefied luxury experience. Here cars really will be like horses, a pastime of enthusiasts, with dedicated spaces for frolicking. Might regulations evolve to exempt future Quadrant 4 designs from mainstream crash tests and insurance guidelines? Could be. So when this happens, we may have an automotive tree with three distinct branches: Quadrants 2, 3, and 4. 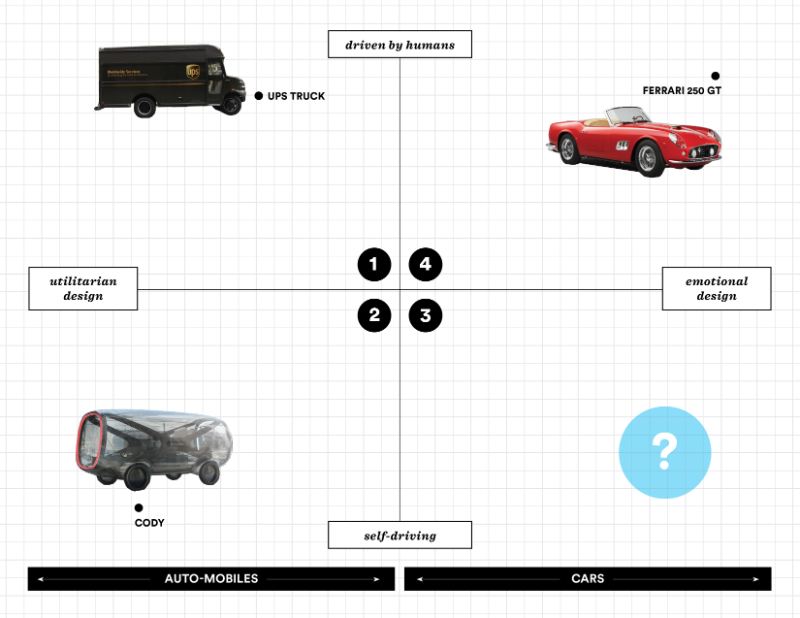 Once we fork the car, Quadrant 1 ceases to be a typology of car you’d see on the street. The emergence of the other three automotive species has interesting implications for purveyors and consumers of mobility in 2025. Today’s automakers still market a dream that smells like Quadrant 4, but as a viable business proposition, this market will radically contract. Simply put, many of us will cease to buy cars that we ever expect to drive. Current auto manufacturers could, however, take their marketing and design savvy and go create emotionally rich mobility experiences for Quadrant 3, and we may buy those instead. This isn’t to say that Quadrant 4 won’t be a lucrative place to do business, but it may the sole hunting grounds of storied marques the likes of Ferrari, Aston Martin, and Lotus, whose bonafides were established in the heroic age of car racing. There’s enormous value to be claimed by new entrants into this forked mobility market. If Quadrant 3 is about the experience you have riding in your car (as opposed to driving it), brands such as Virgin and Disney now have a right to play as purveyors of mobility. Because it’s difficult to teach elephants new dance steps, it may be easier for a customer experience-focused brand like Apple to be successful in this quadrant than to take a car company and make it act as a service or software creator would. And with their emphasis on achieving efficiencies of scope and scale through the control of comprehensive data sets, organizations such as Amazon and Alibaba could dominate the landscape of Quadrant 2. With change comes great opportunity. It’s high time to branch the car, and to start creating exciting new directions for the future. * It could very well take longer than a decade for all the pieces of the puzzle to get sorted out, so I’m using 2025 here just for the sake of argument. A decade implies two or three product cycles for the auto industry, but is a lifetime when it comes to digital devices, which live on an accelerated schedule dictated by Moore’s Law. So while it’s not wise to predict the exact timing of the changes we’ll see in the automotive landscape, the shifts I describe above do seem inevitable. Plus, the year 2025 makes for a headline that rhymes. Many thanks to Piper Loyd for creating the 2×2 graphic above.